Nessie Adaptive USB Mic - Initial Impressions - Victor M. Font Jr.
Nessie, the adaptive USB microphone by Blue Microphones, is in my hands after picking it up yesterday off-the-shelf at my local Apple store. (As a side note, I used the Apple Store app on my iPhone for the first time to scan the product and check myself out. Apple has made it so simple to buy products at their stores, that there's no reason to even talk to any of the Apple store employees any longer, but that's another story). Introduced at the Consumer Electronics Show (CES) 2013, Nessie is the first "adaptive" USB microphone to hit the market. I've been looking forward to getting this mic since reading the initial reports from CES. I record a lot for tutorials, video marketing, pod-casts, music, etc. My time is valuable and I spend way too much time in post-production cleaning up audio. It's one thing to edit video, but it's a whole other animal to get audio recordings to sound great. I'm anticipating that Nessie will help reduce or eliminate my audio post-production editing activities. Nessie’s key features and internal processing are specifically designed to combat the most common pitfalls of recording. The built-in, studio-grade pop filter and shockmount reduce harsh plosives and disruptive rumbling and vibrations, while the adaptive processing, including EQ, de-esser and level control, automatically smoothes and refines your audio in real time. 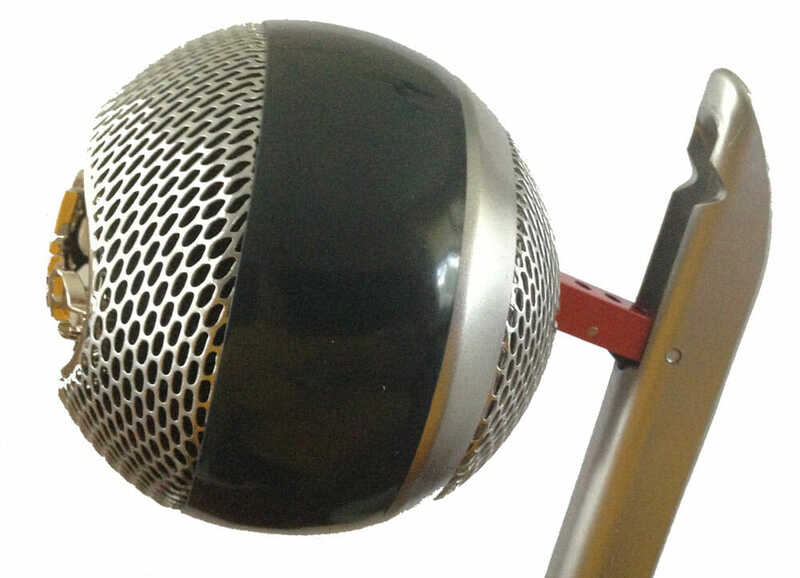 Nessie employs a single custom-tuned condenser capsule with a cardioid pattern. Nessie’s three flexible recording modes are optimized for richer vocals, more detailed instruments or an option for raw audio for manual post-production editing. Nessie features a zero-latency headphone output for direct monitoring, while headphone volume and instant mute are located directly on the microphone. For optimal positioning, Nessie’s head adjusts with serpentine flexibility. Nessie is plug-and-play compatible via USB with both PC and Mac. First, Nessie comes in a BIG box. The box is a lot bigger than it has to be. I suppose Blue Microphones chose the packaging so a consumer feels that they are getting more value than the nominal cost of the microphone. In the box is the microphone wrapped in a plastic bag, a Micro-B style USB cable and a short reference manual that explains how to setup the mic under either Windows or on a Mac. 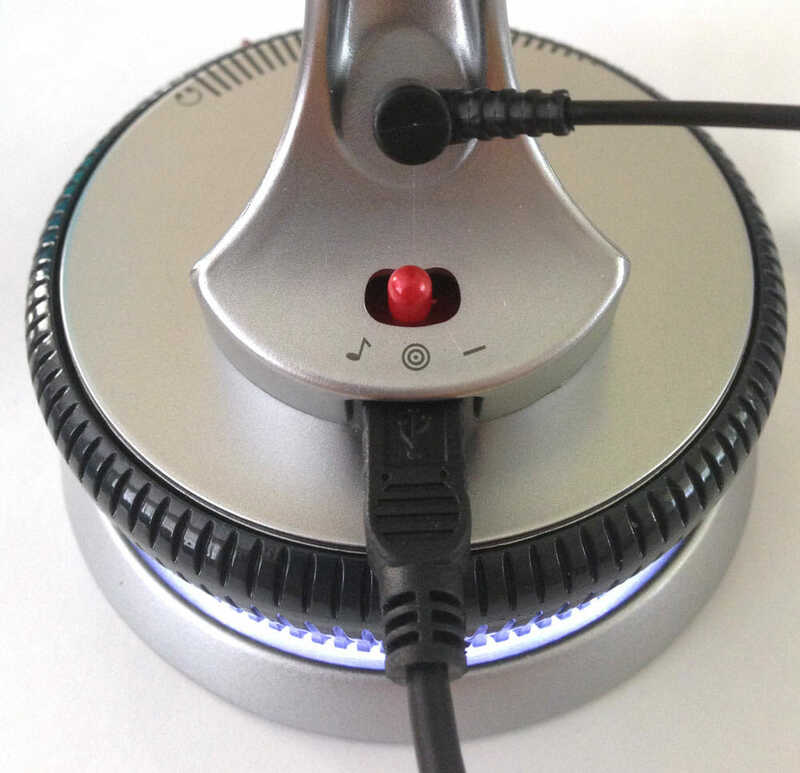 To use the mic, simply plug the USB cable into the mic and your computer and in a few seconds an LED glow appears around the mic's base. Next, select the mode you want, either raw, voice or musical instrument, and you're off recording with your favorite software tool. It's that simple and I could not detect any latency while recording. You can even plug headphones into the base to monitor what you are recording real-time. Nessie's Mode Selector Switch, USB Port and Earphone Jack. So far, I like this microphone. I like it a lot. The audio it produces in voice mode is at least as good, if not better, than I could create through hours of post-production editing. This microphone is going to be a real time saver. I didn't attempt to record music yet, but I did record in raw mode to compare the difference against voice mode. The mute button is a little sensitive. It's a capacitive button which means you simply have to touch it for it to respond. A very light brush across its surface can cause Nessie to mute. I was even able to turn on the mute function by touching it with a stylus I sometimes use with my iPad. It became a little annoying when I tried moving the mic into a different position. Several times I inadvertently turned mute on when I held the base to move the mic. I didn't realize that one of my fingers had brushed against the button. When mute is turned on the LED in the base slowly blinks. I wish the mute button was a little higher up on the neck. There's not much to mention about the adjustable serpentine neck. The head's range of motion is limited. The microphone is very sensitive, though. With the recording gain turned up to 100% on my MAC and my Bose QuietComfort 15 ear phones plugged into the mic's base, I heard things from outside my window and down the hallway in my home that I couldn't hear without the earphones. For example, at one point, I had just finished recording something when I began to hear a rumble in the ear phones. It sounded like the rumble from a truck or motorcycle. I took the earphones off and all was quiet. I put the earphones back on again and the rumble kept getting louder and louder. Finally, I felt the rumble through my feet, took the ear phones off and heard a truck rolling past the back of my home. Later, my wife and daughter were talking in the hallway at the top of our stairs. They were about 15 feet away and I had my office door slightly ajar, almost closed. Without the earphones, I knew they were talking but could not hear what they were saying. With the earphones on, I could partially hear their conversation through the back of the microphone. What's most interesting is that the back of the microphone was facing their direction. So I'm not sure whether I heard them because I had the gain turned all the way up or Nessie's cardioid pattern needs some tuning. But whatever the case, I don't believe I should have been able to hear their conversation through the microphone. Nessie, as it turns out, works well with Dragon Dictation as well. With the mic set in voice mode, I ran through Dragon Dictation's voice training. It didn't miss a word, which is a far cry different than when I've used other microphones. The only other microphone that compared favorably is the Zoom H4N when used as a USB audio interface. The following audio sample is created with Nessie and Audacity V.2.0.3 on a Retina MacBook Pro running OSX 10.8.4. I am reading a short selection from an essay entitled "Youth" by Samuel Ullman. The audio track starts with Nessie in voice mode which means the circuitry is turned on. About halfway through the reading, you'll hear the click when I switched to raw mode. In deference to full disclosure, I must admit that this clip did receive one little bit of post-production cleanup. As I listened to it before converting it to .mp3, I detected the faint hum of our air conditioner in the background. I used Audacity's noise removal filter to get rid of the hum. That was all I did. There are no modifications to change the voice quality of the sample. What you are hearing is what I heard through the monitor as I recorded it. Hey guys thanks for sharing this useful article.